In case you haven't heard, buyer behavior has dramatically changed. Buyers are empowered and more sophisticated and, thanks to the internet, flooded with information and research overload. At the same time your buyers are searching—often in vain— for new ways to innovate, compete, and improve their success. But when salespeople bring valuable insights and ideas to their buyers, they strengthen their relationships, differentiate from their competition, and win more sales. While it may be a new concept to you, insight selling is the heart and soul for how top performing sales professionals sell. It's why they crush their sales quota year after year after year. Rather than talking about insight selling I thought I would share this great video illustrating insight selling. 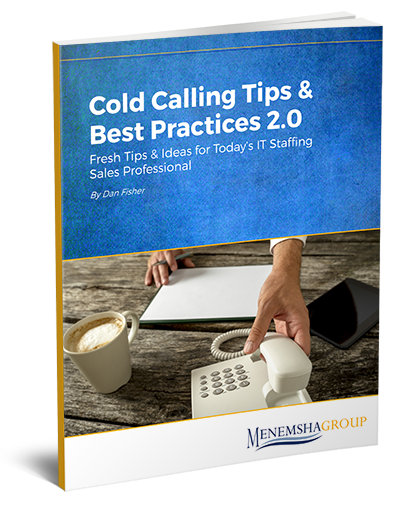 Overcoming the Objection "We Have a Vendors List"
IT Staffing sales professionals commonly run into this objection when calling on new prospects. As soon as the buyer realizes the nature of the phone call he or she says something along the lines of, "We have an approved vendors list. We're all set." What is the best way to reply to this objection? The first thing sales people need to understand is that this objection first and foremost is designed to end the conversation. It's a conversation stopper! The prospect just wants to get you off the off phone. So you're going to have hang in there and keep the prospect engaged. More on this in a minute.